Television Advertising - Sending promotional messages to viewers who watch or experience television programs. TV advertising is changing from push marketing (broadcast), to targeted (addressable), to pull marketing (ads that match viewer requests). 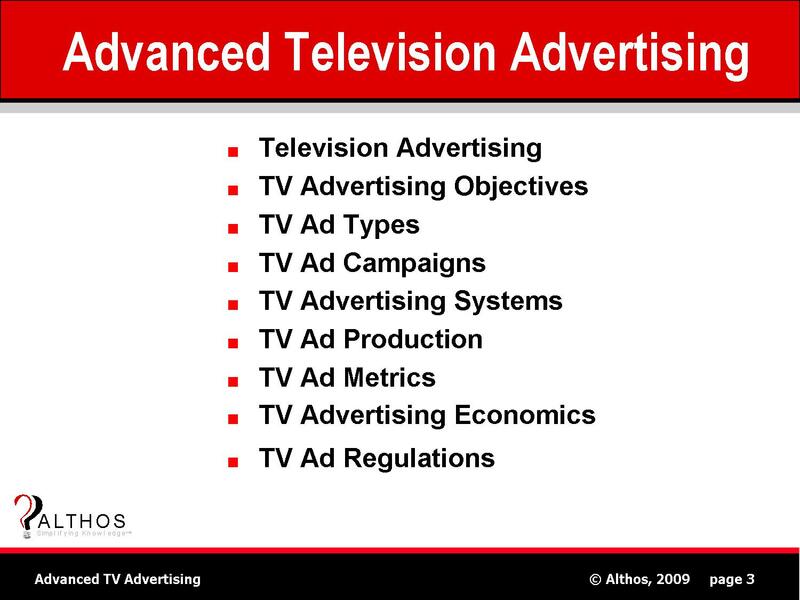 TV Advertising Objectives - Can be product sales, brand awareness, and increased product or service consumption. TV Ad Types - Promotional messages can take many forms including traditional commercials, sponsorships, and product placements. New ad types include expandable ads, interactive commercials, and TV widgets. TV Ad Campaigns - Campaign objectives, audience types, TV media channels (and there are many new ones), campaign setup, and campaign management. TV Advertising Systems - TV advertising systems can select, insert, and track the sending of promotional messages in media content or broadcasts. These systems are changing from specialized ad splicers to IP media servers. TV Ad Production - Ad production is the systems and steps that are used to define, capture, organize, and process content to produce into promotional media segments. TV Ad Metrics - Internet TV allows for the measurement of viewing and interaction with advertising messages. TV Advertising Economics - Revenues and Costs for TV advertising. TV advertising costs have dramatically changed over the past decade. TV Ad Regulations - What can be shown, where it can be shown, when it can be shown. Global regulations can have significant penalties. This book covers how TV ad systems work, advertising economics, advanced TV advertising options, effective and efficient commercial production, and interactive TV ads.